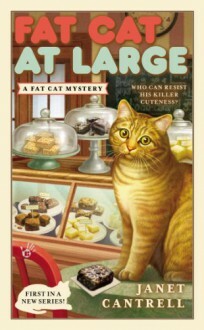 When she’s not dreaming up irresistible dessert bars for her Minneapolis treatery, Bar None, Charity “Chase” Oliver is running after her cat, Quincy—a tubby tabby with a gift for sniffing out edibles. But what happens when this cat burglar leads Chase to the scene of a real crime? The jig is up for Chase’s adorable plus-size cat, Quincy. His new vet says “diet”—that means no more cherry cheesecake bars. From now on he gets low-calorie kibble only. But one taste of the stuff is all it takes to drive him in search of better things. Quincy’s escape is the last thing Chase needs after the nasty run-in she has with underhanded business rival Gabe Naughtly. Chase tracks Quincy down in a neighbor’s kitchen, where he’s devouring a meatloaf, unaware of the much more serious crime he’s stumbled upon. Gabe’s corpse is lying on the kitchen floor, and when Chase is discovered at the murder scene, she becomes suspect number one. Now, with a little help from her friends—both human and feline—she’ll have to catch the real killer or wind up behind bars that aren’t so sweet.